American Airlines’ new B777-300ER aircraft will debut on the Dallas Fort Worth-London route from the end of January 2013, before launching on the New York-London service from February. The carrier announced details of its new fully-flat seating on board the B777-300ER earlier this year, featuring aisle access for all passengers and a 15.4-inch TV screen (see online news January 27). AA will take delivery of the first of ten B777-300ERs later this year, before launching the aircraft on its Dallas Fort Worth-Sao Paulo route from December 13. The carrier will roster the Boeing aircraft on to its Dallas Fort Worth-London Heathrow route on January 31, 2013, followed by New York-London from February 14. Bookings for London-Dallas flights on the B777-300ER will open on May 27. 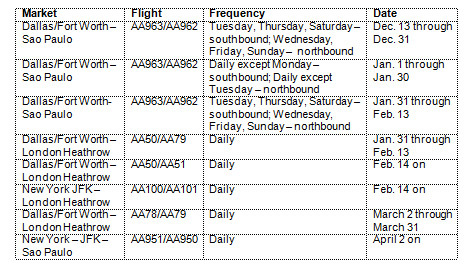 The full schedule for the rollout of the carrier’s B777-300ER is detailed below. As previously reported by Business Traveller, AA is adding a fourth daily service between London and Dallas on June 14 (see online news February 14). The carrier is also set to relocate its check-in area to zones F and G at Heathrow Terminal 3 from May 31, although premium passengers will continue to be able to use the existing flagship check-in in front of the terminal. For more information visit aa.com, and for more details about AA’s new aircraft and seating, visit aa.com/flybetter.